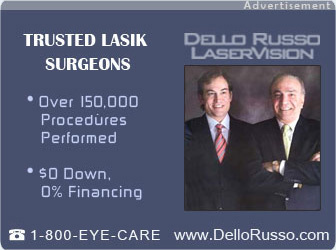 The following recollections were written by Lasik surgeon Dr. Joseph Dello Russo, recounting the early days of vision correction surgery and following a chronological path that tracks the advancements in the field through the eyes of a pioneer who played an important role in developing and improving these procedures. Some may wonder why I am relating the history of LASIK through my own eyes and in the first person. My reason is that I personally did play an important role in its beginning, helping to develop knowledge, and make improvements as well as push forward most of the improvements over these past seventeen years. In the late 1970s, a Russian doctor discovered that changing the shape of the cornea would change the way a person sees. The story goes that a Moscow E.R doctor, Dr. Federov, observed that a teenage patient who suffered corneal lacerations from a windshield injury no longer required prescription glasses after the cuts on the cornea healed. The cuts had changed the shape of his cornea, making it flatter and therefore less nearsighted. The young doctor theorized that if he could cut into the cornea in a more controlled manner, he might be able to change the shape (flattening) of the cornea and reduce nearsightedness. After much experimentation, he did indeed establish a way of flattening the cornea with some control in his nearsighted patients. He called this Radial Keratotomy (RK), and with his proselytizing, his technique became popular around the world. Patients who underwent RK were at first easily pleased since their expectations were limited to being able to drive without glasses (20/40). When Dr. Federov brought his system to the U.S. in about 1976, it enjoyed immense popularity. RK was performed using a broken piece of razor blade which was used to slice into the cornea eight times with pie shaped incisions. The best blades available at that time were the Schick blue blades which were often difficult to come by. My involvement in RK at the time was with the diamond blades which were introduced to replace the Schick blade. I performed RK for about three years with generally happy patients, however as time passed, patients were no longer satisfied to just see 20/40, but in fact did not want to use any glasses at all. Expectations began to outstrip the potential of RK. In 1983, I began to hear about a possible development of a laser to more precisely reshape the cornea. I stopped performing RK and waited for the laser. I have always seen the potential in lasers in ophthalmology. I purchased the first YAG laser in New Jersey, the fourth in the nation, and one of the early Argon lasers. I noticed an ad in an obscure professional throwaway journal, announcing that a Dr. M. McDonald would be hosting the first seminar on “excimer laser” to reshape the cornea, at Tulane in New Orleans. I got one of the few employees in the company on the telephone, and we talked for hours and I decided to attend. I attended the first seminar in laser eye surgery at Tulane Hospital with Dr. McDonald. Hers was the original FDA authority to perform not only laser vision correction on monkeys, but also on blind humans (a testing stage for the FDA), but nobody in my profession knew that this was going on except the handful of us at the meeting. The laser was housed in a trailer in the parking lot outside the hospital. It was huge, and the first laser ever constructed. Just recall what you have heard about the size of the first computers. I recall that the meeting was held inside the hospital and about twenty ophthalmologists attended. I was impressed enough with the results presented that after the presentation; I went up to Roger, the employee that I spoke at length with on the telephone. I vividly recall that one of the patients who had the excimer laser vision correction had hysterical blindness. Somehow she got herself into the blind eye studies and after being treated with the laser, her vision became 20/20. I was so fascinated and impressed that I handed Roger a check for $25,000 as a down payment for a laser. He was completely surprised, so much so that he didn’t know what to do with the check. It was the first $25,000 ever earned by the now billion dollar company. Roger was a happy guy. Steve Trokel, the father of the laser, delighted in telling this tale would relate my behavior at the meeting and how I evaluated the laser and then on deciding to buy the first laser. “Well, Joe went up to the laser, walked around it, kicked its tires and turned to Roger, the only sales person in the company at the time and said ‘Okay. I’ll take one’.” This story became part of laser lore. As cute as this story is though, I did in fact base my decision on the fact that the laser did work. One of the patients who were treated by Dr M. was presumed blind and yet she saw 20/20 after the laser. The conclusion was that she had “hysterical” blindness and was convinced that the laser would cure her and it did. As laser surgeons, we have seen a somewhat clumsy first generation laser continue to evolve into an ever increasingly safer and visually better laser of 2006. For a quick update of the safety of LASIK, you can google the following phrase: “LASIK. Surpasses contact lenses in overall safety”. This will bring you up to date regarding the amazing safety that has developed since the parking lot in New Orleans in 1988. My laser was finally delivered in February of 1990. I have photos of the crane that was used to hoist the gigantic laser through the window on the second floor of my laser center in my small two story office in Bergenfield, New Jersey. My staff and I were giddy with excitement. Once installed, we couldn’t wait until it was time to treat. What we were waiting for was the official permission for the clinical trials to begin nationwide. I was one of the ten primary laser sites in the country that could treat patients under PMA approval. We began recruiting from our practice, started to train the staff and one March day in 1991, we finally treated the first patient. When Columbus sailed the ocean in search of the East Indies, he did not expect to run into the new world. Those were uncharted waters and naive times. Just as Columbus sailed into uncharted waters to prove that the world wasn’t flat, the researchers sailed into uncharted waters in 1991 to prove to a Washington bureaucracy; that we could safely get rid of glasses and contacts with a new laser. The plan was for all ten centers to be allowed to recruit and each center would treat 70 patients for the first hear. And from those eventual 700 patients the “core’ group of patients would be analyzed and the results submitted to the FDA to decide if the excimer laser could be considered safe and effective. Many of the 700 were expected to be lost. Now can you picture ten centers waiting for their trial to given the go ahead? There was great excitement at all centers, but when the day came that we could start treating patients most centers found that they had no patients to treat since the public was not aware of what was available to them. So the first problem was how to recruit patients? A very serious endeavor. Some centers looked to their own patients for volunteers, but most eye practices were geared toward a geriatric base. Those centers which had a general all-ages practice had a greater base, for example wearers of contact lenses. Some centers eventually closed because they simply could not recruit patients. As noted above, four of the ten centers closed due to lack of patients, eventually leaving only six active sites. The successful practices were located in large, dense, urban areas such as LA and NY. In my own center we never lacked for recruits. As soon as the word got out in NY that I was doing this experimental surgery, I was inundated with patients demanding surgery. My problem was who to treat among all those demanding it. One June evening at a group seminar, we had over fifty people for the last few seats. We met our quota and placed the rest of the folks on a waiting list. My seventy patients for the first year were immediately treated. The company was happy with my progress but saddened by the six other centers that could not make their 70. The four active sites filled three quotas in a couple of months. The FDA time clock would not start until the 700th pts was treated. The studies were halted and the other centers given six more months to complete their 70. At the end of the six month period, toward the end of 1991, the untreated number was distributed to the remaining four active sites on a first come basis. I could have done all the remaining 400 on my own, but instead did 128, more than any center. Eventually, from the 700 done, over 217 would be lost to follow-up and be dropped from the FDA submission, totaling 483 treated pts submitted. That is an extremely large number of test pts for the FDA. All the researchers were excited when the last patients were treated and we expected that our period of observation could be as short as six months, and a final FDA approval was anticipated in 1992. However, this was not to be for several reasons, some of which we could control and some we couldn’t. The mood at the FDA was that of inaction. They had come under severe criticism for having recently approving a drug that appeared to be harmful and had been on the verge of approving Thalidamide. With these events the FDA went through a house cleaning in Rockville, MD. And therefore all evaluations of drugs and devices were put on hold for a couple of years. Since it was approving no drugs at all for a couple of years the evaluation of a laser to electively get rid of glasses and safe contacts was put on the back burner. There we sat having completed the tests with good results and not being considered at all. Final approval would not occur until 1996. It was unfortunately bad timing to be applying to the FDA. During this period only a couple of new high priority drugs got through. After 1996, the flood gates opened and an enormous amount of approvals occurred every year. What did the laser company do during this period? They tried to sell lasers outside of the US and raise more money to stay afloat. It actually did not make money from selling these lasers since the cost of R&D and to make each laser, deliver and service the laser far outstripped the income from sales. But the company could plan for the future approval by getting its brand name out there, since suddenly there was competition. The delay at the FDA did allow time for other companies to develop other brands of lasers. Although VISX started the laser industry it would become stalled at the FDA and other companies would develop in the US, Europe and Japan. Dr E who eclipsed Dr T to the patent office went on to form Summit technologies. Summit seemed more organized in their approach to deal with the FDA and meet their guidelines (See http://www.dellorusso.com). VISX and its researchers paved the way to the FDA. It became a race to the finish line with the very survival of each company at stake. Ultimately Summit would receive approval before VISX. Of course as soon as Summit was formed, the two companies sued each other for the patent rights, a suit that went on for a few years to all the lawyers’ delight until an uncanny solution would be reached down the road. So what did we researchers do for the next five years? Well, we were allowed to treat only 25 new pts a year. In my own practice I decided to teach other doctors as well as the general public. As noted above, there were a myriad of stories about Lasik and me in the NY region. I taught my own courses at my office, free of charge to any eye doctors, perhaps a thousand over six years. All doctors were invited. I turned no one away. Not just locals, but doctors came from all over the country as well as abroad. I was happy to share my experience and knowledge. Bergenfield , N.J. became a focus for worldwide Lasik. I wrote about my laser results in journals and lectured at many national meetings. I traveled the world somewhat, teaching in Europe with a small group of the key researchers. These were all very satisfying and exhilarating years. It was just plain fun. My practice is located in a white-collar, blue-collar, densely populated, post war town of one family suburban homes. We are located in Northern New Jersey, ten minutes from the George Washington Bridge, and making all this news about Lasik and a Dr Dello Russo and all this national research. It always amused me in traveling somewhere and give my name and be recognized. The first question would be, “Just where is Bergenfield?” I would tell them it was in the center of my world.